Calexico are a one-of-a-kind, American music treasure. The Tucson, Arizona band, fronted by Joey Burns (vocals, guitars, bass, keyboards, percussion) and John Convertino (drums), has spent over twenty years carving out their unique niche on the Americana music scene. Their broad palette of influences and textures runs deep. Rock, Latin, blues, jazz and folk are at the core of Calexico's sound, with a blend of Southwestern conjunto, tejano, Tex-Mex, Norteño, mariachi and cumbia enriching their music. Spaghetti western soundtracks and Sixties surf rock also dots the group's sonic desert landscape. The Thread That Keeps Us is Calexico’s ninth studio album. The band went to the northern California coast to record, settling into a place called the Panoramic House on Stinson Beach. The new digs fed the creative process, but weren’t the only influence on the album. The Thread That Keeps Us is touched by a sense of unease, reflecting the state that the world finds itself in today; it's grittier and a little tougher than Calexico’s past works. Calexico takes a page out of the Los Lobos playbook on the irresistible tejano song “Flores Y Tamales,” sung entirely in Spanish. "Another Soul" is '70s soul meets '80s New Wave — as if Talking Heads had created the soundtrack to “Shaft.” The song uses horns and electric keyboards for an adrenaline-fueled trek down a dangerous highway. “Eyes Wide Awake” employs layers of guitars and echo to create an expansive and melodramatic setting. Biting guitars and Burns’ sinister vocals give “Dead In The Water” its menacing vibe. The Thread That Keeps Us concludes with “Music Box,” a heartfelt, acoustic lullaby that Burns describes as “a love song for my kids.” With this song, the album ends with a sense of hope that pierces through the tumult. There are instrumental interludes too — “Spinball,” “Unconditional Waltz” and “Shortboard” — that give the album breathing space. They also provide those film soundtrack moments that one comes to expect from Calexico. 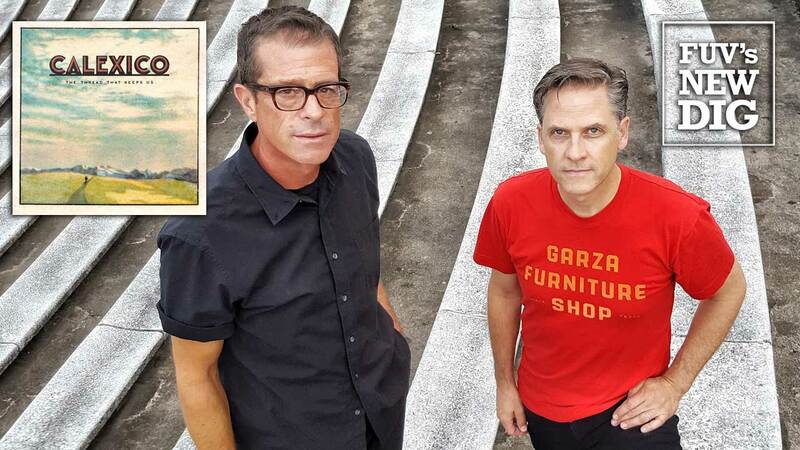 The aggressiveness of Calexico's The Thread That Keeps Us, released on January 26, is evidence that the band has unlimited ability and an unwillingness to play it safe. They are motivated to explore and discover new sounds, styles, and directions. Hear an FUV Live performance by Calexico on WFUV this Thursday, January 25 at 8 p.m. EST or streaming on demand. Calexico also plays Music Hall of Williamsburg on April 28 and Bowery Ballroom on April 29 with special guest Ryley Walker.